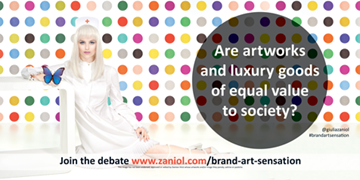 Brand Art Sensation and Zaniol Ltd are devoted to art and cultural critique. The aim of this project is to highlight the commodification tendency of some contemporary artworks and the brand stretching principles that some galleries and artists have borrowed from luxury goods marketing strategies. 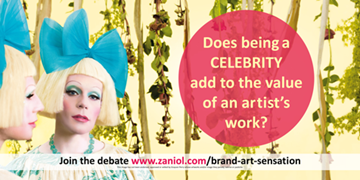 Zaniol discusses here a global art market phenomenon through an artistic study (any reference to contemporary artists is her own imaginative interpretation). This image was the final of three previous shootings. I struggled to show the "brand essence" of Miss Clair. 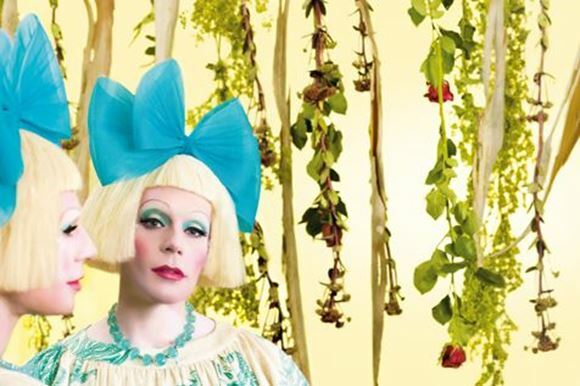 As for Eminent, I needed to have Grayson Perry's Claire modeling for this, but this would not have made it a parody and when contacted his company said he would not be available, ever since I have tried to notify him about the progress of Brand Art Sensation but to this date I have received no reply. I first tried with a stunning female model and created a nice 1950ies interior and sat the model in front of a mirror; her image was then meant to reflect the one of a man in drag. I tried this setting over and over, but it would look too parodic and not "luxury" enough. I also realised that the concept itself wasn't probably right. Finally, I went back to the basic advertising rule: "keep it simple". The background is my interpretation of Grayson Perry's horror vacui drawing style. I wanted to recall the yellow of some of his most famous vases and his intricate patterns without stepping onto his magnificent drawing styles.